The Notes From Nature team is really excited to be involved in the WeDigBio event that is taking place this week! 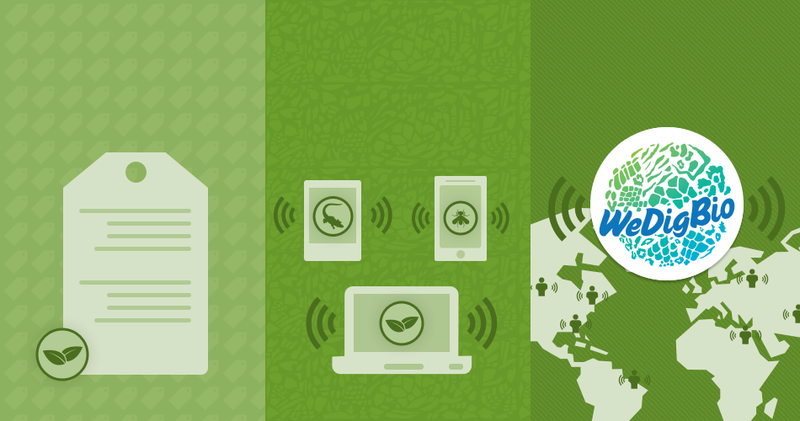 WeDigBio stands for Worldwide Engagement for Digitizing Biocollections. It is a global event that focuses on digitizing of natural history museum specimens, which is something we care very deeply about. Notes From Nature is not the only transcription tool that is being used. There are others such as the DigiVol in Australia and Les herbonautes in France making this a truly global event. The focus of the WeDigBio event is on onsite digitization gatherings that will take place around the world over the next few days. Many of these events will include fun activities and tours of the museums. Notes From Nature has been primarily a distributed group of people working towards a common goal. We are excited to see how bringing people together in one place will go and we certainly hope it will be an engaging and fun experience. Even though most of the events are onsite, you can still participate from wherever they are! You can track the progress on the very cool dashboard on the WeDigBio site. We will also be using the hashtag #WeDigBio on Twitter and Facebook, along with some blog updates during the event, which runs from tomorrow Oct. 22 to Sunday the 25th.